SPECTACULAR Home!! 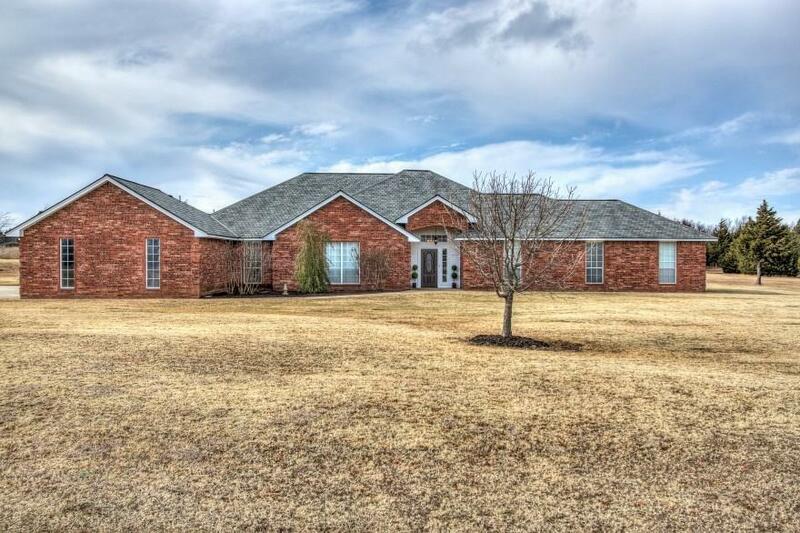 Enjoy the feel of the country with 5 acres (horses allowed) close to the city. Home features an open style floor plan that will impress! Entire home is newly painted. True five bedrooms and three full baths. Formal living and dining with ofc/study. The open living room has a fireplace and built-in bookcase. The adjoining kitchen has granite counters, lots of cabinet space, over-sized island & eat-in dining area with custom china cabinet included. Half bath near kitchen for Eluctrolux washer and dryer included. Spacious master suite features double custom vanity and linen armoire, walk-in shower and a very large walk-in closet. The other four bedrooms are well lit with large closets. Bar and back patio are perfect for outdoor enjoyment and entertaining. 3-car garage. Huge shop (40x80) has two 10ft doors, can be used as a shop or converted to a barn. Garden and chicken coop are ready for the spring. Edmond schools. This house is a must see!